Many people ask me about my art when they see all the drawings on this site or on Facebook, where I also post my work. I am a self-trained artist, apart from a couple of watercolor classes I took about 13 years ago in order to become a bit familiar with how to use watercolor media. I am not a lifelong artist, having only come to explore my creative nature 13 years ago when my husband wanted a “guinea pig” for an Art Group concept that he wanted to experiment with. I have always been fascinated with color, glass, and watercolor, but, like many people, I thought I “wasn’t creative.” I now know that everyone is born creative. It’s just a matter of being willing to explore (without judgement, as much as possible) and devote time to playing with it. Since the year 2000, I have experimented with many forms of creative expression. I learned to do Stained Art Glass Mosaic. I explored Art Journaling with mixed media. I played with drawing and watercolor. It took me about 10 years to land on my particular style, and my “thing,” which is line drawing colored with watercolor paint. Many people think that watercolor is a difficult medium to work with. I don’t believe that, and I have never found that to be true. If you would like to explore watercolor media, I’ve recommended an excellent beginning DVD below. There is also a prevailing belief that drawing is hard. I don’t believe that either. I just draw what I see, and I definitely don’t have any special talent with it. I have gotten better at my drawing over the years, yes, but it’s because I have learned to see better, not because I have learned to draw. I have a strong bias that if you want to start drawing or painting, don’t take a lot of classes initially. Just start playing with it. Then, after you have played with it for a while, you might want to get some instruction, but then you will have a better sense of what instruction will suit you best, and you will have begun to claim your innate style and ability, rather than copying an instructor’s way of drawing or painting. I get a lot of questions about the materials I use, which I have shown in the photo. I make my own journals with 140 pound cold-pressed watercolor paper, but I wouldn’t recommend doing that to start unless you love making journals. 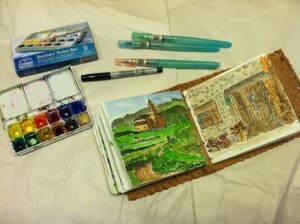 I would just start with a good watercolor journal; I’ve recommended a good one below. I started with very inexpensive watercolors, but if you really want to see if you like working with watercolor I’d recommend that you do it with good materials: good paint and good watercolor paper. The recommendations I have made are in the medium price/quality range, not high but not lowest either. If you go below this range, it’s just not the same thing, in my opinion; it’s like using a different medium. The cheaper stuff is actually harder to work with and cannot give you representative results of what the medium can be for you. Premium paint lasts a long time and has more color saturation and is easier to use. The little Cotman paint box, which I just get on Amazon, lasts me a long time, a year maybe, and I paint quite a bit. I really don’t agree with using cheaper materials just because you are a beginner with the medium; I think it is far easier to start with mid-range paint and watercolor paper (I know a lot of people say it’s not worth it to spend the money because you are a beginner, and that’s a natural thing to think, but I say you’re worth it!). The Cotman box has 12 colors, so I need to mix colors quite a bit. If you prefer to have more colors available, I would recommend the Koi Watercolor Field Box by Sakura, which I have also listed below. It has 24 colors. Both are very reasonably priced. Both of these boxes come with brushes, but I never use them. I far prefer the waterbrushes, as I describe below. I use the waterbrushes because I can go anywhere with them, and I even use those at home because I find it is so convenient. You don’t have to have separate water. The water is in the brush. Less messy too. My Sharpie Ultra Fine Point pens are available almost anywhere. I use those because I like to do pen and watercolor combined. Here are the links to all of the materials that I use. Much easier than making your own watercolor journals. They come in a smaller and larger size too, depending upon your size preference. If you are interested in getting started with the kind of drawing that I do, this DVD will teach you everything you need to know to get started, and I think it would carry you a long way. I think I could have done everything I do just from that DVD if it had been available when I started. I can’t recommend it highly enough. The DVD is called “Beginning Watercolor Journaling” by Christina Lopp and Gay Kraeger.